In early 2006, the Leadership Round-table chose to devote three consecutive monthly sessions to assessing and analyzing gender dynamics and patterns in the movement’s leadership roles. This included examining and debating how assumptions and cultural conditioning had shaped women’s options and choices in roles. In early April, as the mass mobilizations of immigrants were sweeping the country, PCUN and CAUSA called for a mobilization to the Oregon State Capitol in Salem on April 9th. Thousands turned out, overwhelming the security team organizers’ had hurriedly assembled. Days later, we decided to answer the national call for massive marches on May Day. The staffs of CAPACES network organizations gathered to chose or assign roles for what we all expected to be (and was) the largest gathering in Oregon history at that location for any occasion or issue. One of the most daunting was coordinating security, a function that had always been carried out by men. This time, three women volunteered to coordinate both security and police liaison. They led a security team of nearly two hundred volunteers (and including many women). City, county and state law enforcement commanders—deeply apprehensive beforehand—all praised the security operation which maintained order and quickly defused provocations by a handful of anti-immigrant zealots. When the three women were asked why they had volunteered, they credited the CAPACES discussions for motivating them to break through the barriers. One of those three was Lorena Manzo. Lorena Manzo is one of many young leaders who will benefit from the CAPACES Leadership Institute. 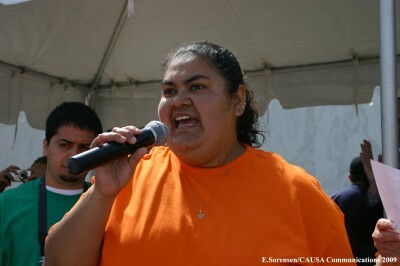 Originally from Mexico, Lorena made her way to California at the age of 15. In 1997, she moved to Woodburn where she worked in the strawberry fields and eventually earned her GED. Her involvement in the movement began eight years ago, when she met a neighbor who was a member of Mujeres Luchadoras Progresistas. She joined MLP’s project economic self-help project—farmworker women making and marketing Christmas wreaths. As an MLP volunteer and part-time staff member, she had opportunities to learn skills in public speaking, fundraising, and administration. MLP connected her with PCUN and CAUSA. And Lorena’s path? “I’m preparing to be director of an organization,” she responded, confidently.